Italian Landscapes in the Anthropocene – Hello. Welcome to Andrew Mathews' site! The Anthropocene, the contemporary era, where every aspect of ecosystem processes around the world has been affected by human activities, has generated a flowering of experimental research methods on the social sciences. Even as natural scientists concerned with global environmental change have come to realize that their descriptions of ecosystems cannot predict the future deterministically, anthropologists, historians and other humanistic social scientists have turned their attention to provisional descriptions of patchy and unstable landscapes. 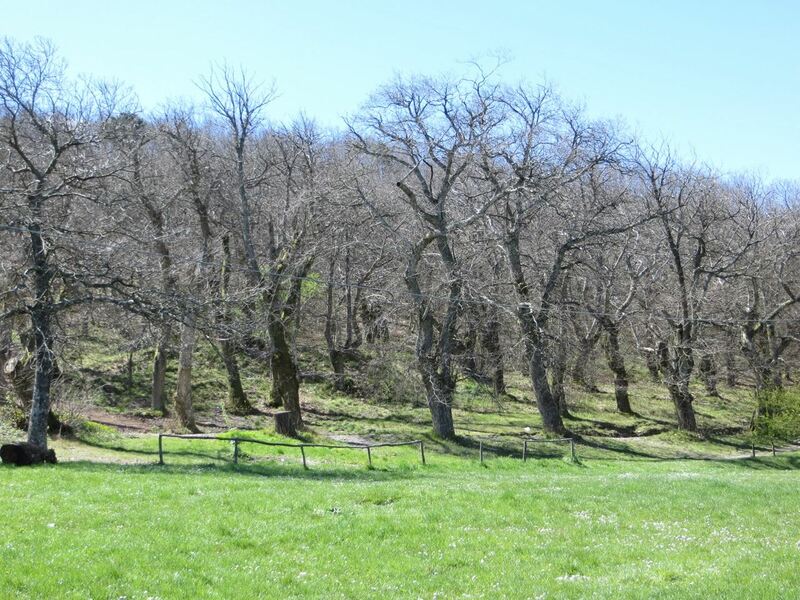 By focusing on the historic and contemporary transformation of a particular landscape, the Monti Pisani, between Lucca and Pisa in Central Italy, this research project seeks to build collaborations across disciplines and to inform contemporary environmental politics and decision making. Anthropologists and historians have a crucial role to play in helping scientists understand possibilities of transformation, rapid change, and catastrophe that are often ignored in scientific predictions of global environmental change. Cows can become feral and transform landscapes, as happened across Latin America in the 16th century. Phytopthora molds can shift from being unproblematic local infestations to destroying entire potato crops or tree species, as in the case of potato and chestnut blights in Europe and North America in the 19th and 20th centuries. Peasants can become urban industrial workers, with a dramatically different relationship to plants, soils and landscapes, as has happened across the Mediterranean since World War II. These kinds of dramatic events are usually unknown to scientists who try to understand global environmental change. Often, they do not have access to historical and ethnographic records which show the depth and rapidity of past social and environmental changes. Through our capacity to attend to conflict and association, to metamorphosis, symbiosis and rapid change, humanistic social scientists can broaden and make visible the range of pasts and the related futures that might emerge from Anthropocene political and environmental transformations. In Italy and around the world the premise of most climate change policy has been that ordinary people do not understand climate change. This project on the contrary seeks to show that people make sense of climate change using the material and imaginative resources provided to them by the landscapes they live in, as well as by their experience of particular state institutions. In interviews with ordinary people in the Lucca/Pisa area, we have found that ordinary people are less concerned with atmospheric carbon dioxide and increased temperatures, than with the dangers produced by powerful events such as floods and forest fires. Many people call upon the Italian state to respond to climate change not through sustainable energy policies, but by restoring landscape stability. They are broadly supportive of firewood cutting that resembles traditional coppice/ceduo methods and which supplies home heating needs. In contrast, they are often skeptical of climate change policies that support large biomass energy plants that produce electricity for the national grid. Location Map of the Monti Pisani (Map by Fabio Malfatti). Our interest in the past is not simply historical. We seek to collaborate with natural scientists concerned with global environmental change, using the landscape archive of the Monti Pisani, in Central Italy to broaden the range of environmental futures contemplated by climate change modelers, ecologists, and others. We see a politically informed historical ecology and environmental anthropology as a resource to help ordinary people make sense of the political choices that they might wish to make. Histories of key plant and animal species, of industrialization and agricultural abandonment, are a resource for imagining multiple Anthropocene futures and for making these futures properly political. A key contribution of the humanistic social sciences to making sense of global environmental change, is through our classic methods of oral history, ethnography, and archival research, as well as through a reinvigorated critical natural history which makes imaginative use of drawings and direct observation. 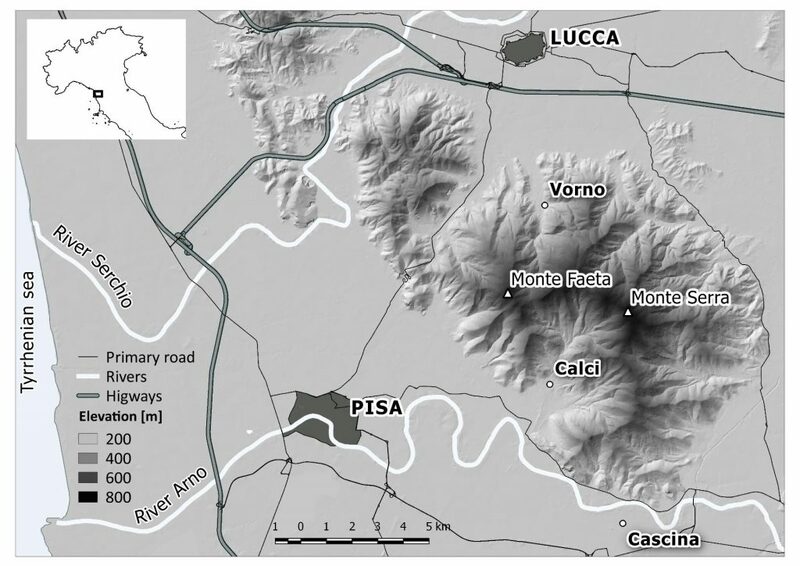 Starting in 2013-2014, Andrew Mathews and Fabio Malfatti have built a collaborative research project which brings together ethnographic, natural history, and archival evidence from the Monti Pisani, between Lucca and Pisa. 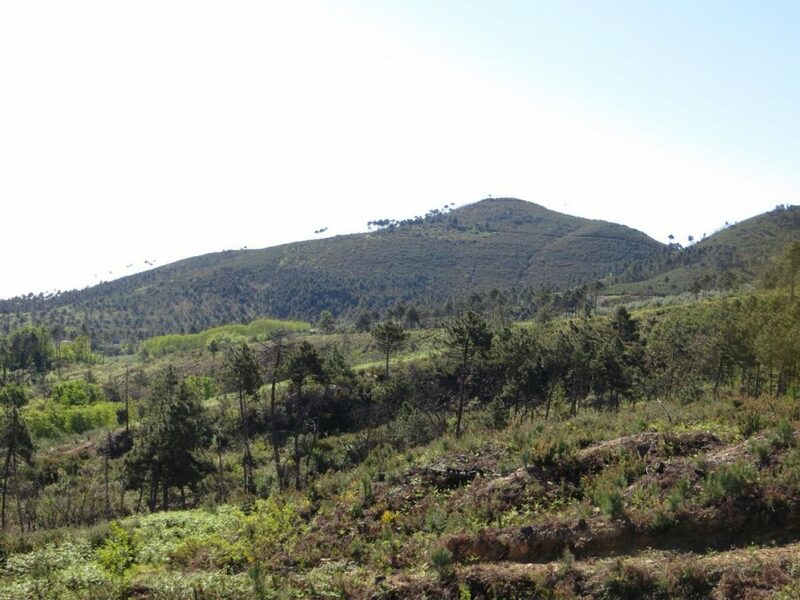 This mountain range, an area of about 20,000 hectares, stretches from near sea level to over 900 meters in elevation. This mountain range contains evidence of forest cultivation, of plant disease outbreaks, forest fires, and agricultural abandonment, of terrace building, water powered industrialization, and more recently, of industrial development and tourism. In sum, this small area is a microcosm of the kinds of environmental changes which affect Mediterranean landscapes more broadly. We have conducted over one hundred individual or collaborative ethnographic interviews, complemented by farm and forest visits with farmers, foresters, and scientists. 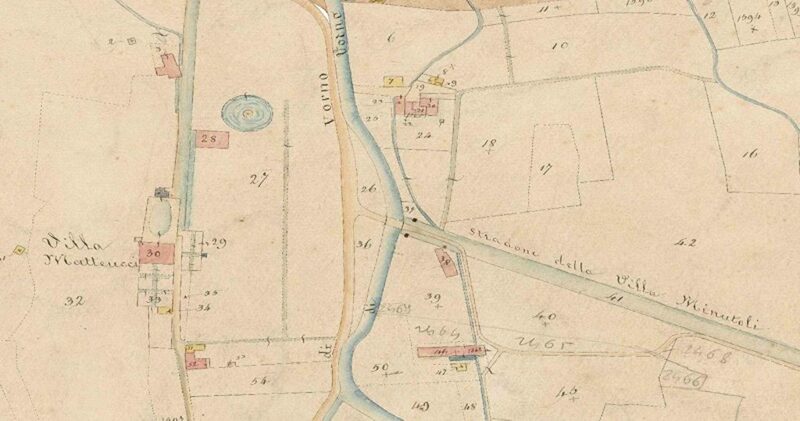 The cadastral maps in the Archivio di Stato of Lucca and the Archivio di Stato of Pisa contain a detailed historical record of land use in the mid nineteenth century. Aerial photographs and ecological surveys give us an account of the present landscape. 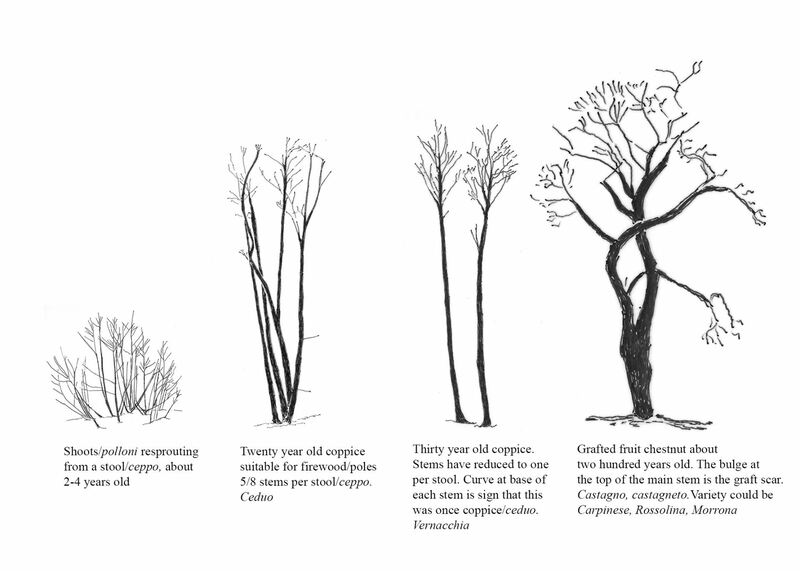 Oral histories, ecological surveys, landscape walks and detailed drawings of particular trees and terraces, record the impacts of the pathogen outbreaks and forest fires that have dramatically transformed this landscape. Cadastral Map from Vorno, Monti Pisani, 1843. Source, Archive di Stato, Lucca. These maps are linked to records of cultivation. 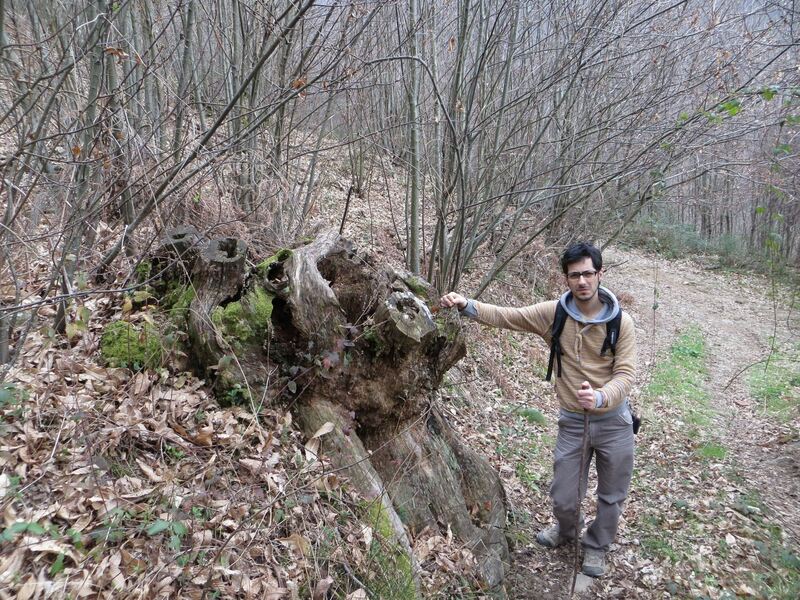 Stump of Ancient Chestnut Tree with Francesco Roma-Marzio. Pizzorna, Lucca, 2014. Fabio Malfatti, looking for traces of Vite maritate (Poplars pruned to support grape vines). 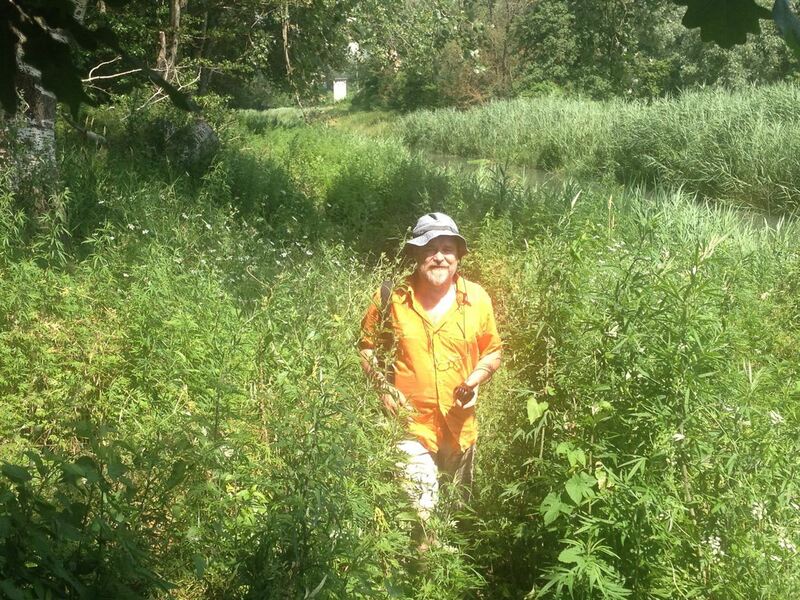 Near the river Ozzeri, Lucca, summer 2015.